I recently created another iphone application: iLoop. This is a multi-track loop generator for programs such as Garageband. It's intended to be a fun musical app that allows users to record short loops of real audio, edit and overlay them, and build new sounds or music. Users of iLoop should read the extensive instructions here. If you still have any problems, please leave a comment at the bottom of this entry and I will try to respond in a day or 3. I'm also looking for links to audio or video that have been made using iLoop. If you've created a great loop or weird new sound, please put it online and I will link to it so that everyone can see your work! I hope you enjoy the app. If you'd like new features or changes to make the app easier to use, please also provide suggestions in the comments below. Amanda - the app just uses the current microphone if you're using the white earphones with the built in microphone make sure its clear of clothing etc. Mark - it does work on iOS 8, although it's still formatted for the screens of older devices. However I think Apple may be removing some older apps like this one now. Hi Peter, Can you tell me is it working on iOS 8? Is any chance to update iLoop and add audio copy ability? Hi Peter, I'm trying to use the loop but my voice comes out muffled and static like every time. Any help on this issue? Hi Mike, it is designed for short sound loops with an unlimited number of overlaying tracks. At present 15 seconds is the limit; as memory on devices becomes greater I may change this. I bought this thinking I could do multi track recording but with a 15 second limit per track, it's pretty useless to me. Am I missing something? Hi Marlow, yes it does allow real time monitoring. Note the app has now been tested for firmware 4 on iphone 3G and works fine! Does iloop allow for monitoring the recording in real time? The reason I ask is because I would like to hear my electric guitar while recording, which I can't hear unless it is monitored through the headphones while recording. Hi Bryan, if you're stuck please look at the instructions online! The app lets you overlay as many tracks as you like and edit them and add special effects. It's designed as a short real-audio loop generator but there's no reason why you should not be able to record and overlay guitar riffs to make something cool. Send me a link to the file if you manage it! Peter. I've been looking for a cut-down Garageband/Logic-like app for the iPhone, and this looks interesting. But I would definitely want to be able to import audio files (prefereably WAV, but could be ripped formats too). Good start, nevertheless! Hi Peter, I like iLoop, but have one major problem with it. 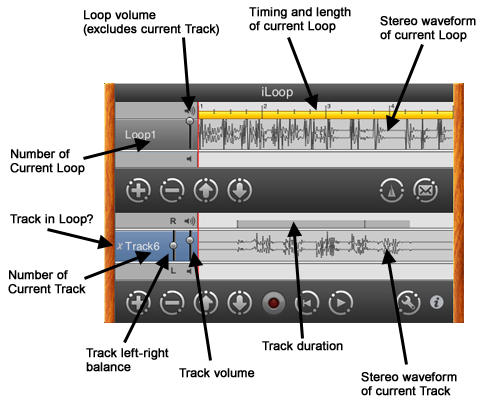 Maybe it is my understanding...: Intuitively, I would start recording a loop, add some sound and then stop recording. I then would assume the loop duration would then be adjusted to the duration of the first recording (or better the first recorded track when the begin and end are trimmed). As it is, it seems that the duration is always a fixed number of (whole) seconds. Even if I use the metronome, there is no way to adjust the loop so that it does not oddly loop into the middle of a beat (unless I set the metronome so that the beats exactly match a whole number od seconds)? What do I misunderstand, i.e. how can I create a loop that is not an exact multiple of a second? I've just completed a minor upgrade to iLoop, which should be available in a week or so. Version 1.01 adds the following features: (1) Track volume is automatically set after recording in order to provide improved playback. (2) Swipes can be used to move between the panels of the function window. (3) No longer crashes when headphones are unplugged. Hi Marc, thanks for your very detailed comments. I'll answer them here: (1) distortion and clipping during recording... it's hard to know how to set the volume in advance because I don't know how loud the audio will be for a user at any moment; I don't want to use auto volume control as that will affect sound quality. If you have a suggestion for how much quieter you'd like the recording to be by default do let me know, otherwise I'd suggest you lower the Track volume to make it acceptable. (2) I need more info on this - I don't see this on my device. I am aware that plugging in or unplugging a 3.5mm jack can make the app crash, (it's trying to deal with the new audio path while hanging on to lots of audio data and tripping over). Until I fix that, the solution is only plug in stuff before running the app. The app does not play through the "handsfree speaker" because it's a stereo app designed for headphones and the recordings will just become a feedback howl if the device plays loud audio that its own microphone can pick up. (3) I couldn't think of a really fast way for users to name Tracks because I wanted recording to be quick, but I might introduce name categories... watch this space (4) The problem is memory and speed - 30 secs uncompressed CD quality stereo means about 5Mb per Track, which will be unbearably slow for multiple Tracks unless you're rich enough to have a 3G(s). (5) The Track is not shown in the Loop because you need to be able to isolate it (e.g. put Loop volume to zero and still hear the Track). (6) Ordering... ironically it used to be the reverse order but I had complaints so switched it. Now up arrow means numerically up... kinda makes sense. (7) you mean the demo tracks? It will only ask if the first 3 Tracks are all not there. If you leave Track0, 1, or 2 there then you will not be asked to install the demo tracks. Hi Nick, thanks for your comment. 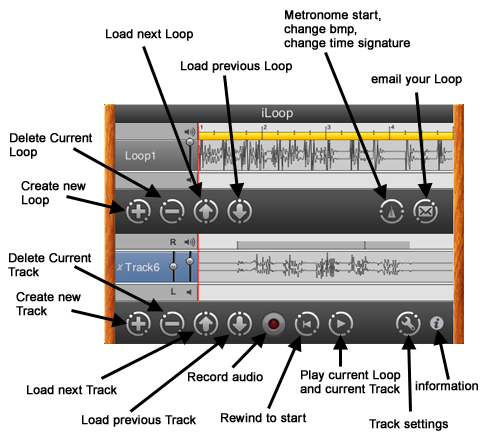 The app is a multi-track recorder and audio editor for sound loops. If I get a lot of requests to import audio then I may look into it... But that's not really the purpose of the app. Peter.